The Phantom 2 Vision+ drone revolutionized the consumer drone industry by providing exceptional quality at an affordable price. Now DJI has done it again and taken the Phantom 3 to the next level. I was one of the first on board to order this drone and organized the sneak peak information below to provide the “pre- DJI Phantom 3 review” to my readers. I want to note that there are two versions of the Phantom 3; the Advanced and the Professional. My DJI Phantom 3 review is focused on the Professional version. Before I get into my DJI Phantom 3 review check out DJI’s new video shot on the Phantom 3 drone. Pretty great huh? The clarity is immaculate. Now let’s get down into the specs and upgrades/downfalls for my DJI Phantom 3 review. Additional features: Follow me function allowing the drone to act as your personal film crew and follow you as you travel. Flight app controller through any mobile smart device. What’s Changed from the Phantom 2? DJI has upgraded their Phantom models with the Phantom 3 by drastically increasing the flight range on this new drone. Additionally they incorporated some of the features their Inspire 1 has into the Phantom 3. Features such as the vision positioning system that allows the drone to be flown indoors in the absence of GPS without crashing into walls. These are just a few of the upgrades some of the others you can see below. Increased Range. The Phantom 3 now has the ability to travel up to 1.2 miles away. This is a drastic advance from the 550-765 yard range the Phantom 2 Vision+ has. Follow Me. The ability to follow you in autonomous fly. This is great for when you’re trying to film action shots yet don’t have anyone to fly the drone for you. 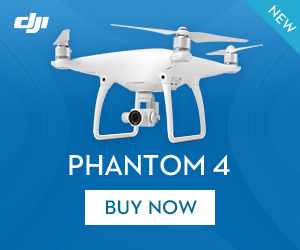 You now have your own film crew with the Phantom 3! Camera. While filming you’re shooting 4K video at up to 30 frames per second and capturing 12 megapixel. Images are crisp and the HD view can be streamed live to YouTube if you choose. The gimbal is also a 3 point system providing stable imagery. IMU. The Inertial Measurement Unit runs on a 6-axis gyroscope which picks up any tilt alterations in the flight and corrects itself automatically so that your drone remains stable if thrown off balance. Mobile App. The new mobile app is amazing and offers a lot of additional features. The app provides on the fly video editing, live YouTube streaming, a wide range of camera control options, flight logging stats, and the most innovative part; a flight simulator that allows you to practice flying in a simulation before hitting the field. Learn more about the app here. Return Home. The Phantom 3 has a “failsafe” function meaning once the battery drops below a designated power level or if you lose the connection, the drone automatically returns safely to its specified landing location. This is a life saver so that you don’t lose the drone in the case of low battery. The only issue I can point out now in this pre-review of the Phantom 3 is the battery life. The battery life on this drone (~23 minutes) is still much longer than most other drones however it isn’t as long as its predecessor’s 25 minute expectancy. I would have thought that while updating all the other features that this would have been a big one to revamp too. Aside from this there are very few things I expect to be wrong this drone. Keep in mind I haven’t flown it yet. I am on the list to be one of the first to get this drone and will be updating my DJI Phantom 3 review if I do find any errors with the Phantom 3. I am very excited for this new launch and updating this blog as I fly the Phantom 3 throughout the summer. DJI has always had unmatched products and the Phantom 3 will no doubt hold up to this in my mind. To see my other drone reviews check them out here. If you are ready to graduate from the beginner drones and move into the heavy hitters with serious imagery and flight capabilities, the Inspire 1 is the multi rotor drone of choice among experts. It’s no surprise that my #1 drone also comes from the highly advanced lab of DJI technologies. The company leaves practically no room for errors in their higher end products and that quality is seen instantly upon flying any of their multi rotor drones. As with my other reviews, I’ll run through the specs on the drone first. Additional features: Carbon fiber arms give you the strength to maneuver in the air and they transform, moving out of the camera’s way at the flick of a switch. With a full 360⁰ unobstructed view, you now have the freedom to capture shots independent of the direction you are flying. What Makes the Inspire 1 Multi Rotor Drone Exceptional? Vision Positioning System. A feature to aid in stabilization and remain in position in the absence of a GPS signal. It uses a camera system and sonic waves to hold position or navigate indoors. Computing Capabilities. The Inspire 1 packs a powerful battery cell with extensive monitoring capabilities. The on-screen app lets you see the remaining battery life, the flight time, altitude, flight speed, historic flight paths, as well as multiple other flying metrics. Autonomous Fly. As with the other drones I’ve reviewed, you can also plot a course via your app and let it do the flying while you do the filming. Dynamic Home Point. Regardless of where you are the drone will find you and land. This is great for when you are on the move and want the drone to land with you and not where it took off from. 360 View. This drone has carbon fiber arms that lift up to allow for a 360 view for filming shots unrestricted. You buy the package with one remote so you fly the drone as well as control the camera. The second option is to get the upgrade package with two remotes so that one person can fly while another operates the camera. The two controller option is great because it allows you to really take some high quality footage without worrying about crashing. Even though this is my top drone of choice for those who are ready for it, there are some downsides to it. No GoPro. If you have a GoPro and were hoping to use it with this drone it’s out of the question. DJI built the Inspire 1 to accommodate only DJI cameras. Price. This multi rotor drone is the most expensive of those I’ve reviewed on this site. It comes in at $4,200 with 1 controller. Not something your beginner flyer would want to buy just yet. It make’s complete sense why it is so expensive due to all the features though. Experience. This isn’t a drone for those looking to get their first one. It requires a good amount of previous flight time to handle as well as some understanding of calibrating the system. I’ve seen some cases where less experienced flyers buying this have had ‘run-aways’ with it, resulting in a crash, and for the price it’s not something you want to wreck. The video below is DJI’s overview teaser of the Inspire, all the footage for the video itself was shot with the Inspire 1. Shows you how great the camera capabilities are with this. Movie quality aerial capabilities for ~$4,000. This multi rotor drone comes with all the bells and whistles but not without paying for them. If you’re looking for getting your first multi rotor drone I’d advise starting smaller and working your way up to this. I only say this because most don’t want to risk crashing a $4,000 drone while learning to fly. If you are ready though to start taking amazing shots and/or creating your own films with this high quality drone then get ready to be blown away. Below is a link for you to get it direct from DJI. Or if you’re an Amazon fan and prefer to buy it there here you go. Now for my review of the long anticipated DJI Phantom 3. For this review I wanted to spotlight two quadcopters with camera capabilities; one for the intermediate level flyer and one for the younger kids or beginners. The first will be a very brief look at some of Parrot’s other products then we’ll jump to the commonly known Parrot AR 2.0 (Power Edition). You may recognize the Parrot company name through their other drone products like their Jumping Sumo drone (non-flying) or their mini Parrot Rolling Spider (great for younger kids). The Rolling Spider is a small handheld drone that is controlled through your cell phone. It weighs only 55g and has an 8 minute flight time. One of the smaller quadcopters with camera capabilities, though the camera is positions straight down and can only take shots form that angle. Great for kids or beginners but it doesn’t have the power I usually look for in a drone. If you are interested in starting with the Rolling Spider I’ve grabbed the link for you below. Parrot also just released their new drone the BeBop which has the add-on option of an advanced SkyController remote. I haven’t tested this drone out yet so unfortunately I can’t give you a review of it yet. If any of you venture out and pick up the BeBop (here’s a link to it), stop over by our Facebook page and let me know how it turns out for you so I can gauge whether it is an improvement or not. Back to the AR 2.0, what I really want to talk about in this post. The Parrot AR 2.0 has become one of the most commonly owned quadcopters with camera capabilities due to its moderate price and features. Additional features: The Director mode lets you program automatic movements so that you can shoot great videos just like a movie director. If you’re not ready to drop $1,400 for the Phantom 2 Vision+ but are ready to upgrade from your beginner drone then the Parrot AR 2.0 is one of the top quadcopters with camera streaming to go to. Easy to fly. The AR 2.0 is quite easy to fly, which done through a mobile app that can be downloaded via your smartphone or tablet. You can do a few tricks with this drone as well such as flips through the air with ease. Keep in mind the more stunts you do the more you drain your battery. Live stream. The Parrot AR 2.0 has live feed capabilities allowing you to see in first person view as you fly. Video and still images can be recorded to either an on-board internal USB drive or recorded directly on the control device. Intuitive. There are two options for flying the drone; the first is by tilting your control pad forward, back, left, and right to fly it in the direction you wish. The second method is to use the on-screen joy sticks to fly. This method resembles the controls of PlayStation controller. HD camera. The Parrot AR 2.0 powers a 1280 x 720 pixel camera that captures 30 frames per second. You can also take still frames while in flight mode and either save via USB or send to your piloting device. GPS upgrade. You can purchase the Flight Recorder GPS ($120) to select waypoints that autonomously fly your drone at various elevations and speeds. The best way to show you is by watching the video below. Unfortunately there are a few things about this drone I’m not crazy about. Occasional control loss. The first of which is the occasional loss of control when you fly too high. The transmitter isn’t as powerful as the DJI drones so if you fly too high the connection is lost resulting in the drone to plummet. Most times during the free fall it will regain sync and you have control again but there have been instances reported where it hit the ground. To avoid this I’d recommend not pushing it to the 164ft distance range, just keep it a little closer. Battery charge time. Though the Power Edition of the Parrot AR 2.0 does allow you to get 36 minutes of flight time from the two 1500mAh batteries it takes a couple hours to charge them up again and you do need to manually switch them over after 18 minutes. Glitchy. The flying software does take a while to start up but once it’s going it’s pretty easy to navigate. While you shop for the AR 2.0 you’ll notice that there are 3 versions; the original, the power edition (which I reviewed here), and the elite edition (link here). The power edition provides you with the best battery pack for longest flight time. The Elite edition provides more hull options. Well, the Parrot AR 2.0 is a great drone but not completely without any flaws. Though I did point out some issues with this drone I believe that compared to others in the same price range, it is probably your best bet and is pretty fun to fly, especially with the stunts. If you’re ready to grab one I’ve placed the link below for you to grab one. My final review is for the exceptional movie quality Inspire 1.